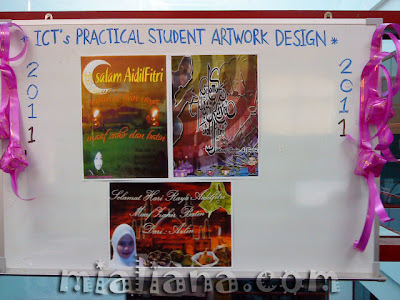 Like usual, practical students will be assigned to do their own design using Adobe Photoshop. 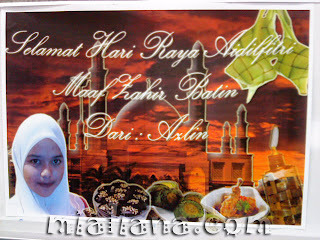 But this time, Mia asked them to create Raya Card on A4 paper. So what do you think? 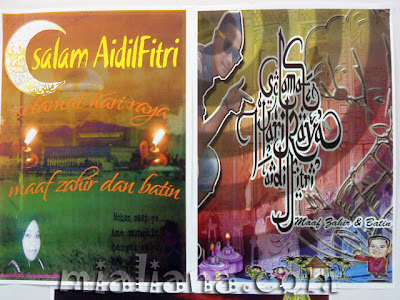 At least they knew how to design using different layers, changing the original images and blending the colours. Introducing Aimerul, student from Politeknik Arau taking Diploma in Programming (4 July - 4 December 2011), Saidah and Azlin.. students from Kolej Komuniti YPJ Segamat (18 July - 4 November 2011). Although only 3 students, they do help ICT Unit to do daily operation such as repair computer and printer, troubleshooting network, backup, installing drivers and others. I was so happy that they had finally finished the design assignments. Although a bit difficult at the first time, later on, when they get use to it, they will create a creative artworks. After Hari Raya, they will have to study programming code and create a new system. Whatever it is, they have the intention to study and learn new things and hopefully this will help them in their future career. All the best!